The latest piece of Volkswagen's quest for world dominance is the introduction of a three-row crossover to Americans, who will seemingly buy just about any three-row crossover. And to compete with the big boys, you need one of these people movers. 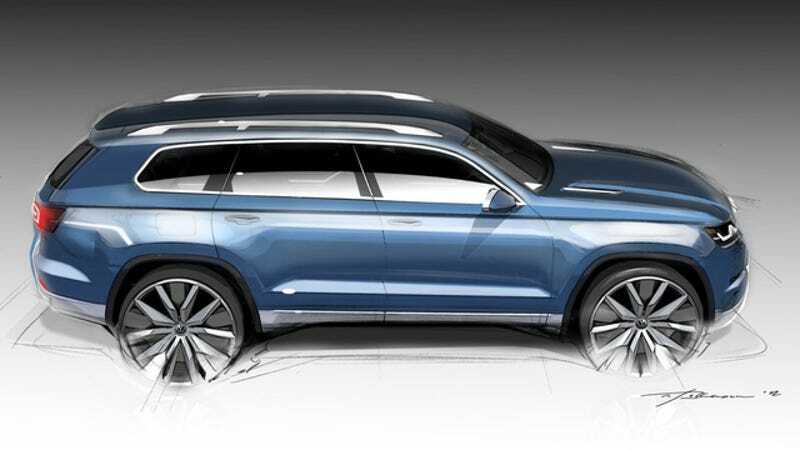 Autocar published Saturday the first sketch of such a vehicle, rumored to be built at the Passat's plant in Tennessee. Expect it to share more than a few bits and pieces with VW's big sedan, too. Volkswagen needs a competitor for things like the Honda Pilot and Ford Explorer, and the largest SUV VW offers now, the Touareg, only has two rows of seats and is too plush and expensive. That's why you should expect this crossover – which will have a name likely ending in -an, because that's how VW rolls – to follow the Passat and Jetta recipe of being bigger and cheaper. It's also a given this will replace the Chrysler-built Routan minivan in the lineup. So there are several details missing, but one thing is very apparent in this first sketch: Doesn't it really look like a Jeep Grand Cherokee from the side?